This very detailed false-colour image from ESO’s Very Large Telescope shows the dramatic effects of very young stars on the dust and gas from which they were born in the star-forming region NGC 6729. A close-up view of a busy star-birthing region shows the dramatic effects newborn stars have on the gas and dust from which they were formed. Although the stars themselves are not visible, material they have ejected is colliding with the surrounding gas and dust clouds, and is creating a surreal landscape of glowing arcs, blobs and streaks. Stars form deep within molecular clouds, but the earliest stages of their development cannot be seen with visible-light telescopes because thick layers of dust obscure the observations. In this image, there are very young stars in the upper left of the picture. They cannot be seen directly, but the havoc that they have wreaked on their surroundings dominates the picture. High-speed jets of material that travel away from the baby stars at blazingly high velocities slam into the surrounding gas and create shock waves. These shocks cause the gas to shine and form the strangely colored glowing arcs and splotches of material, which are known as Herbig-Haro objects. The astronomers George Herbig and Guillermo Haro were not the first to see one of the objects that now bear their names, but they were the first to study these strange objects in detail. They realized that they were not just clumps of gas and dust that reflected light, or glowed under the influence of the ultraviolet light from young stars, but were a new class of objects associated with ejected material in star formation regions. In the new ESO image, the Herbig-Haro objects make up two lines that outline the probable directions of ejected material. One stretches from the upper left to the lower center, ending in the bright, circular group of glowing material at the lower center. The other starts near the left upper edge of the picture and extends toward the center right. The peculiarly shaped bright feature at the upper left is likely not a Herbig-Haro object, but is a result of starlight being reflected from the dust. 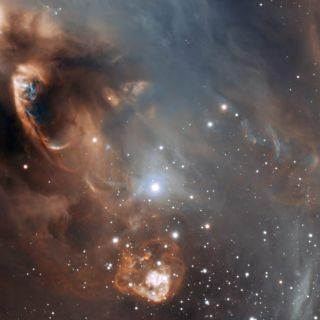 This enhanced-color picture was created from images taken using the FORS1 instrument on ESO's Very Large Telescope. The observations were selected by Sergey Stepanenko as part of ESO's Hidden Treasures astrophotography contest. The competition invited amateur astronomers to dig through ESO's vast archives and transform raw, gray-scale telescope observations into gorgeous full-color images of space. Ten winners who submitted a total of 20 images were ranked as the highest entries in the competition out of almost 100 submissions. Stepanenko's image of NGC 6729 was ranked third in the competition.